I have previously worked out at a regular gym and just wasn't satisfied anymore. I needed a challenge along with a change in my ordinary routine at the gym. So one day I left work and saw a sign that read "CrossFit" of Chalmette. That's when I called the number and set up my first trial class and since then I have been hooked! Its hard to describe the box. What I love about the box is the challenging routines with the enthusiastic coaches. The coaches are always there making sure you are properly performing the routines correctly and pushing you to the end when you just feel like giving up. First, I would like to say don't get discourage after you attend your first class. Second, set your goals and don't worry about everyone else when working out at the box. I can recall getting discouraged when the rest of the class could climb ropes and I could barely hold on to the rope. After several months of hard work and dedication I can climb that rope today! Basically, what I'm trying to say is that everyone will be on a different level at the box don't try to be on anyone else level. Just always perform at your best and set your own personal goals. 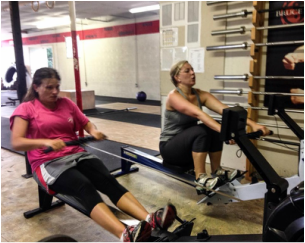 Favorite WOD-"Cindy and Griff". Least Favorite-Anything with overhead squats! I would like to become stronger, set some personal records, and participate in the Murph Hero WOD. 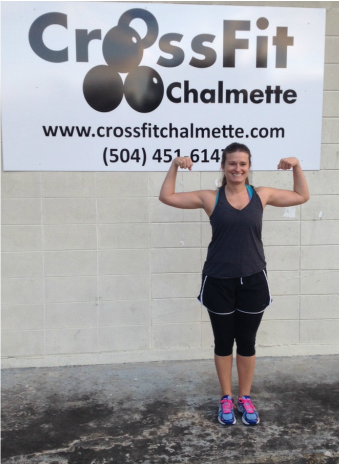 Congratulations to Crissy on her selection as the CrossFit Chalmette Featured Athlete for Fall 2015! You have improved so much since your start with us at the box! Keep you with the great attitude that inspires us all! Keep practicing those Overhead Squats!